Wecart – Multipurpose Store OpenCart Template is perfectly designed for electronics, computers, accessories, fashion, food, jewelry, tools, apparel, cloths, kitchen, medicine, furniture, mega, minimal and multipurpose stores. This theme is unique and look simple for selling any types of products. This template is 100% responsive which fully compatible with all latest browser and devices. It supports multiple language and currency to sell your products worldwide. We have included quick start files with this theme to install this theme on your server with just one click. Parker Fashion OpenCart Template is a Multi-Purpose Premium Responsive Theme. It is super for Home, fashion, inspector, Decor, furniture, Interior, Exterior, minimal for every type of store. Moreover, the Fully compatible with all of the mobile devices. Fresh – Organic OpenCart Template is designed for Fruits, Foods, Grocery, Vegetables, Coffee, Bakery, Organic, Minimal and Multi purpose stores. This theme is looking very nice with its clean and professional look. Powertools multipurpose OpenCart Template is a responsive OpenCart template designed for all stores and businesses selling any kind of Furniture machines, any types of tools, easy to use, Auto parts, car tools, Accessories and multipurpose purpose store. Fashmart – Mega Store OpenCart Template is developed in Opencart Framework. Electronics, computers, fashion, furniture, accessories, food, apparel, cloths, kitchen, jewelry, tools, medicine, mega, minimal and multipurpose stores. It is developed in such way that user can easily customize page using our component and customize it without too much hassle. With the help of 1-click installation you can setup your whole store within few minutes. Shopmart – Mega Store OpenCart Template is developed in Opencart Framework. electronics, computers, fashion, furniture, accessories, food, apparel, cloths, kitchen, jewelry, tools, medicine, mega, minimal and multipurpose stores. It looking good with its colors combination and unique design. The template has latest technologies like bootstrap, HTML, CSS and many more. StoreFlex – Wedding Store OpenCart Template is a perfect template for wedding store owners. It has everything you’ll need for a successful business. The products are divided into the categories. Each product page has a standard set of options. You’ll also find there such tabs as description, additional info, reviews and video. Moreover, you can adjust this template for any kind of online store you want. Fast Box – Accessories Store OpenCart Template is designed for fashion, bag, shoes, goggles, apparel, jewelry, diamond, clothes, accessories, kids, cosmetic, watches, purse, minimal and multi purpose stores. This template is fully responsive which means no matter which device use to view your store, it will scale beautifully to suit each device each browser. Also multi-lingual & multi-currency support for your customers from other countries. This template is also available with quick start files to install this theme on your store with just one click with all content and images like our demo store. 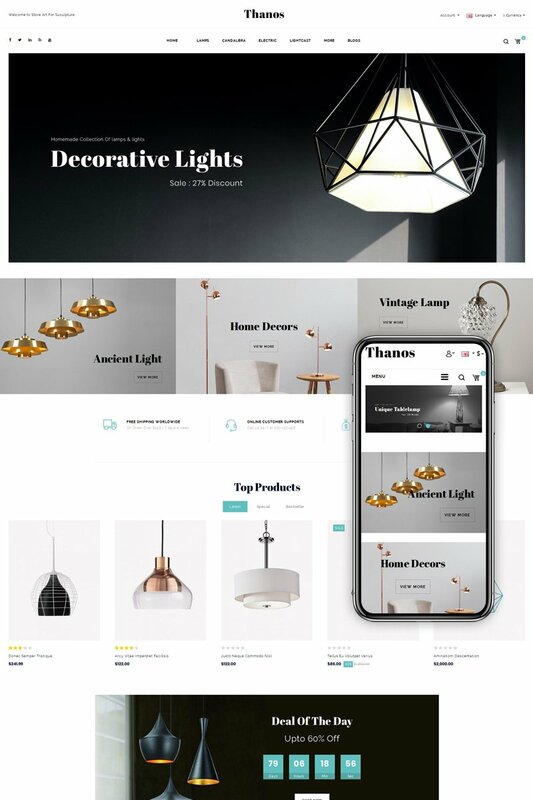 Thanos – Lighting Store OpenCart Template is an advanced OpenCart 3 theme with fully customizable features and suitable for e-commerce websites of any multi purpose. In theme package included One-Click to get a replication of our theme demo site on your website with same content, theme settings & layouts. Thanos theme is flexible and can adapt multiple shopping cart websites. Thanos theme is suitable for selling all things such as : fashion, jewelry, accessories, women’s, lighting, furniture, cosmetic and shoes store. Shoplist – Mega Store OpenCart Template is professional minimalist responsive OpenCart Theme built to create modern powerful e-commerce web-site. Shoplist OpenCart theme is SEO optimized to be friendly with most popular search engines. In Shoplist theme Configuration gives the control with flexible settings, fast loading, fast support and much more. And Including OneClick (QuickStart) package to get a replication of our demo theme installed on your website with same demo content, graphics, theme settings & layouts etc. YellowBag OpenCart Template is a fast, reliable and stylish website for your store. Being based on OpenCart platform, this template uses parallax technology. It is one of the most advanced technologies of modern web design, when the background images move slowly than the elements located in the foreground. That will create stunning visual effects on your website. This template also has Ajax search and Ajax cart, that will make your visitors able to use live search function and to immediately see the total price when they change the quantity of products in cart. Musean – Musical Store OpenCart Template is properly designed for music, instruments, guitar, violin, sound, audio , lighting, flowers, fashion, furniture, mega, electronics, crafts, home, minimal and multipurpose stores. It’s 100% responsive with all devices and browser compatible. This theme looks good with unique colors and professional design. We have also include quick start files to install this theme with sample data like our live demo store with one click. Wingstore – Mega Shop Responsive OpenCart Template is specially developed for electronics, furniture, fashion, automobile, tools, mega store and multipurpose stores. It is looking aesthetic in colors with all sub pages are customized and also very nice and professional look. It is suitable for small to medium business for sell eCommerce products online. Array-Fashion Opencart Theme is specially designed for fashion, clothes, jewellery, cosmetic, and multi purpose stores. Array Opencart Theme is looking good with colors combination. All sub pages are customized. It is very nice with its clean and professional look. Rainbow – Opencart Theme is a Responsive Theme designed for kids, toys, babies, food, health, drugs, medical and multi purpose store. Rainbow Opencart Responsive Theme is looking good with colors combination. Most importantly, all sub pages are customized. Besides that, it is very nice with its clean and professional look. Jewellery Opencart Theme is designed for jewellery, cosmetic, fashion, shoes and multi purpose stores. Jewellery Opencart Responsive Theme is looking good with colors combination. All sub pages are customized. It is very nice with its clean and professional look. Camera OpenCart Theme is a Responsive Theme designed for camera, electronics, mobile, sports and multi purpose stores. Camera Opencart Responsive Theme is looking good with colors combination. All sub pages are customized. It is very nice with its clean and professional look. eShopping Opencart Theme is designed for electronics, mobile, drugs, medical, cosmetics, furniture and multi perpose store. eShopping Theme is looking good with colors combination. It is very nice with its clean and professional look. Smart Shop – Multistore Opencart Theme is a Multipurpose Ecommerce Theme for any online store such as fashion, digital, cosmetics, electronics, games, shoes, sports, watches etc. Smart Shop opencart theme comes with Pre made layout with fully responsive, clean and elegant design and also additional features like product view with additional images in featured, bestseller, latest and specials. Other features such as auto search feature in header, Vertical megamenu and mobile menu,Unique Product detail design, Convenient product view, Product zoom with additional image slider, product image thumb with additional images view, product slider, Hybrid Module, ajax cart,etc. Shopz Mart – multi purpose OpenCart theme is a Ecommerce Theme for any online store such as fashion, digital, cosmetics, electronics, games, shoes, sports, watches etc. Shopz mart opencart theme comes 3+ with Pre made layout with fully responsive, clean and elegant design and also additional features like product view with additional images in featured, bestseller, latest and specials. Other features such as auto search feature in header, Vertical megamenu and mobile menu,Unique Product detail design, Convenient product view, , Product zoom with additional image slider, product image thumb with additional images view, product slider, Hybrid Module, ajax cart,etc. Calista – Multipurpose OpenCart Theme is a Ecommerce Theme for any online store such as fashion, digital, cosmetics, electronics, games, shoes, sports, watches etc. Calista OpenCart theme comes 5+ Pre made layouts with a fully responsive, clean and elegant design. It also includes additional features like product view, with additional images in featured, bestseller, latest and specials. Other features such as auto search feature in header, Vertical megamenu and mobile menu,Unique Product detail design, Convenient product view, Product zoom with additional image slider, product image thumb with additional images view, product slider, Hybrid Module, AJAX cart, etc. TShop – Multipurpose eCommerce OpenCart 3 Theme is the Stunning Multipurpose Responsive Theme designed for any online market store, mega store, fashion/clothes store with a bundle of functional features. fShop – Advanced Multipurpose OpenCart Theme is one of the best OpenCart Template for any eCommerce site based on OpenCart 3. It is perfect for online stores like cosmetic, shopping, digital, and shoes shops. fShop will definitely satisfy you by its design, function & powerful features. By the attractive homepage slider with many smooth effects, multi-language, multi-currency, image popup view and much more, super faster speed, fShop – OpenCart 3 theme will enhance the customer’s experience. Try it now!